I have a lot of reading to get done this week...a lot of catching up to do! I probably won't update every day. Probably just a couple of times. Here we go! on Monday (starting now), I have to finish The Tudor Conspiracy, C.W. Gortner and work on catching up on Far from the Madding Crowd, Thomas Hardy. Tuesday--finish catching up on Far from the Madding Crowd before TuesBookTalk chat at 8:30pm CST and get back into City of Bones, Cassandra Clare...have to finish before I see the movie next weekend. the rest of the week...Under the Dome and The Talisman, Stephen King/Peter Straub. Over the weekend, work on Age of Desire, Jennie Fields for a review on Tuesday. If I have time, possibly do some reading in preparation for Sit Down and Write 4 (my write-a-thon) next week. Are you doing Bout of Books? Good luck with your goals, if you are! Wow, you are quite specific with your goals! Good luck and have fun! That's ambitious and very specific! CIty of Bones is great. Enjoy! Good luck with your reading goals!!! I probably should take some time getting caught up on some reviews in anticipation of your write-a-thon next week. I have other plans for that!! Best of luck with your goals. I read Under the Dome. Good, but quite a chunkster. See you around the read-a-thon. Welcome to Bout of Books! If this is your first bout of books, I just want to introduce myself to you. I'm Faye and I'm an expert this week, so if you need any help or have any queries, feel free to ask me! You can contact me in my comments (here) or catch me on twitter (@daydreamin_star). 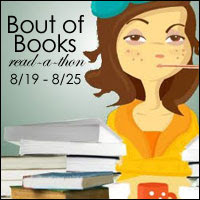 Otherwise I hope that you have a great read-a-thon and manage to win all of your goals!